More than a century ago, Wrightsville Beach became the first successful community to bring surfing, a popular West Coast sport, to the East Coast. On a postcard speckled with age, a photo shows a dozen or so surfers on their stomachs, trying to catch the last of a small breaker. 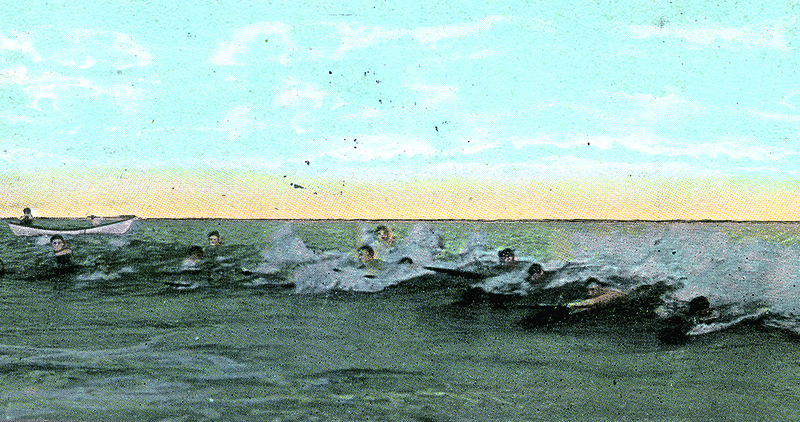 This early 20th-century promotional postcard from the waterfront Oceanic Hotel in Wrightsville Beach illustrates a historic era: the beginning of surfing on the East Coast. More than a century ago, Wrightsville Beach native Burke Haywood Bridgers was fascinated by the pastime that was sweeping the Pacific Islands, and he was determined to bring surfing to his own community. In 1910, after reading an article by Alexander Hume Ford about surfing in Hawaii, Bridgers wrote to the South Carolinian-turned-Hawaiian surfer for advice. Wrightsville Beach surfers had found little success with lightweight juniper boards, and they were unable to get past the breakers. Bridgers wanted to do more than just ride the board on his stomach. Tenaciously confident that he could adapt the techniques of the Pacific to the waters of the Atlantic, he asked Ford about board shapes and designs, surfing styles, and how the waves broke on Hawaii’s shores. Ford’s wisdom encouraged Bridgers, who continued to craft his own surfboards and organize and promote surfing events in North Carolina, earning him recognition as a pioneer of East Coast surfing. For more on surfing in North Carolina, see The History of Surfing in North Carolina.